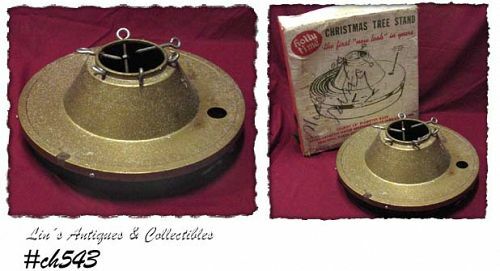 This is a find -- a Holly Time tree stand for use with a live tree! Per box, the first "New Look" in years, and "Sturdy 18" diameter base, extra-capacity water reservoir holds over 2 1/2 gallons, beautiful baked enamel finish". Top of stand is gold color with glitter, bottom is black. Has a top water-fill opening. It's in very good condition, has some minor rusting. Box is in good condition and it proudly states "Made in America by Americans with American Material". Unusual find!